The Republic of Seychelles is an archipelago and country located in the Southern part of Indian Ocean. The "115-island country", which capital city is Victoria in Mahé island is situated northeast of Madagascar and about 1,600 kilometers east of the Kenya. The majority of the islands are uninhabited, with many dedicated as nature reserves. The population of Seychelles amount about 97, 000 which 90% currently live on Mahé, 9% on Praslin and the rest on La Digue. Nowadays, Seychelles displays the highest nominal per capita GDP in Africa, excluding the French regions. It is said that Austronesian seafarers and later Maldivian and Arab traders were pioneers who visited first the uninhabited Seychelles. The earliest European record dates back to 1502 when the Portuguese Admiral Vasco da Gama sighted the group of islands. The earliest landing was in January 1609 when Captain Alexander Sharpeigh and his crew landed from the "Ascension" during what is considered to be the fourth voyage of the British East India Company. Seychelles had always been a transit point for trade between Africa and Asia. The group of islands were occasionally used by pirates until the French took control of the territory in 1756 with a Stone of Possession that was laid on Mahé by Captain Nicholas Morphey. The islands were named after Jean Moreau de Séchelles, Louis XV's Minister of Finance. The landmass of Seychelles is relatively limited with a total of 459 km2; however, its 115 islands are spread over a large Exclusive Economic Zone of 1,374,000 km2. There are two distinct group of islands composing the archipelago: the inner islands, mostly granitic, and the coralline outer islands. The granitic group is made of the oldest oceanic islands in the world. They are also the only islands on the planet made of granitic rock. The coralline outer islands are much younger, flat with elevated coral reefs at different stages of formation. Seychelles islands are part of the granitic Mascarene Plateau which separated from the Indian Plate about 66 million years ago. This rift formation is associated with Reunion Island hotspot which is also responsible for the formation of other volcanic lands: the Chagos-Laccadive Ridge (Chagos, Maldives and Lakshadweep islands), the southern part of the Mascarene Plateau and the Deccan Traps in India. The climate on Seychelles does not evolve much although it is quite humid and considered as a tropical rain forest climate. Variation in temperature is little throughout the year and oscillates from 24 to 30 °C. Rainfall ranges from 2,900 mm annually at Victoria to 3,600 mm on the mountain slopes. The hot months are from December to April, with higher humidity (80%). March and April are the hottest months with temperature rarely exceeding 31 °C. Most of the islands lie outside the cyclone belt, so high winds are rare and cyclone / typhoons not so common. Isolated from other lands, Seychelles are home to number of endemic vegetal and animal species. About 75 endemic plant species are listed in the granitic islands and additional 25 in the outer islands composing the Aldabra group. A species of palm, the coco de mer, grows only on some islands of Seychelles (Praslin and Curieuse). This palm tree produces the world's heaviest seed. Another endemic tree is the jellyfish tree, only to be found in some areas of Mahé but today critically endangered. In the animal reign, the endemic Seychelles black parrot, a sombre-coloured, medium-sized parrot only lives in Praslin island and is seen as the national bird. Seychelles hosts some of the largest seabird colonies in the world, notably on the outer islands of Aldabra and Cosmoledo. Bird species such as Sooty terns, Cattle egrets and Fairy terns are proliferating on the islands. Underwater, the marine life around the islands, especially the more remote coral islands, can be spectacular with more than 1,000 species of fish and crustacea having been recorded. Fundamentals of Seychelles’ cuisine include fish, seafood and shellfish, often accompanied with rice, aromatic herbs and spices (e.g. cinnamon, nutmeg, ginger, cardamom). As mixed as its population, Seychelles cuisine is the result of a great variety of influences from French, Chinese, Indian and African contributions. Some famous Seychelles dishes to be mentioned are "bredes" broth, fish "rougaille" (made of tomato), fish carpaccio, breadfruit stew, as well as the "millionaire salad" made of fresh palm hearts, the "flying fox" (bat) or "zourite" (octopus) cari, the coco cari and the "tec-tec" (clams) soup. Dishes are often combined with fruits, vegetables and sweet potatoes. The chili sauce, emblematic of the Seychelles archipelago, is presented separately and accompanies many dishes. Another very spicy sauce which is very popular in the archipelago is the "mazavarou", a preparation made of red chilis, garlic, ginger and boiling oil. Fish and seafood are the key components of Seychelles cuisines. Steamed, grilled, wrapped in banana leaves, baked, salted or smoked: fish dishes are cooked in several ways. Presence of curry dishes, shark chutney, dhal, saffron rice reminds the influence of Indian cuisine locally. "Ladob" is one of the national dishes: it is made of ripe plantain and sweet potatoes boiled with coconut milk, sugar, nutmeg and vanilla. It can be served hot or cold. 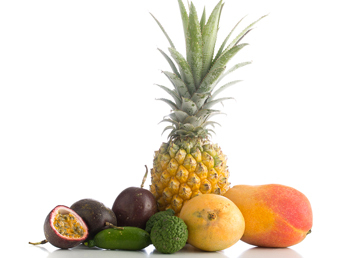 Tropical fruits and vegetables are also grown locally and participate to the local diet of the Seychelles people.